I've also had Earth First come up with BMW following pretty soon after. Yesterday I got 6 new race suits in like 3 hours. Today I spend like 10 hours checking, and not a single new one showed up. Does anybody got one of those recently? Forza RC, Forza RC Seattle, Forza RC WC, M. Rossi, Ugly Sweater Party, Jack Rabbit, Hyundai 2019, Year Of The Dog, Safe And Sane. 4 days have passed without any new driver gear. So I guess they didn't exactly release ALL of the rare driver gear. No, I’m waiting for exactly the same Driver Gear as you are. I got the Push it to the Limit, BMW, and Earth First in a one hour period on 17 March. Nothing new seen since. Same here. I got the Halo, Gears of War, and Minecraft ones and a few others, but nothing new since. Any word on whether M. Rossi will ever be unlocked? It seems like a weird thing for it to be locked for over a year, since in the game intro sequence for FM7 it was revealed that M stood for Maria - that seemed somewhat special. Not making that suit available for anyone seems like a big oversight. I agree completely, it definitely seems strange. It was strange when the Tanner Foust Suit wasn't a prize during his very own Bounty Challenge, especially when Turn 10 hypes up the community train constantly during different events and streams. I could've sworn I read some have seen the M. Rossi suit in the race shop directly after the Update containing the Race Shop itself. I dunno maybe I'm remembering wrong. I can concur with others, only having seen and purchased the BMW, Earth-First, and Push it to the Limit suits since Turn 10 saying all Driver Gears would be available in the Race Shop now. I have even been checking to see if the coveted ForzaRC Suits showed as an already owned suit, being I already have all the RC suits, but I have not seen them either, for ex. already owned. I check often while playing and pay close attention even to the suits I already own, which are slightly harder to read being covered in a dark tint, when just taking a fast glance to look for new items. Good luck to all hunting the suits they still need. FYI, I just had one turn up. "JD - Race lie you were being chased by the Swarm"
Thanks, saw your post above and thought I'd check - I'd previously given-up. Any statement from T10 yet? Because they said they will unlock all the driver gear, but now we see that are still several locked ones. Like everyone else, i got a bunch of driver suits that i didn't have in the first couple of hours of searching, and then nothing since. and i have had a few days where i was sick and did nothing but watch tv and have the game open checking the race shop every 6 minutes. i've had the race shop open so much, the word race shop is burned in to my old screen. 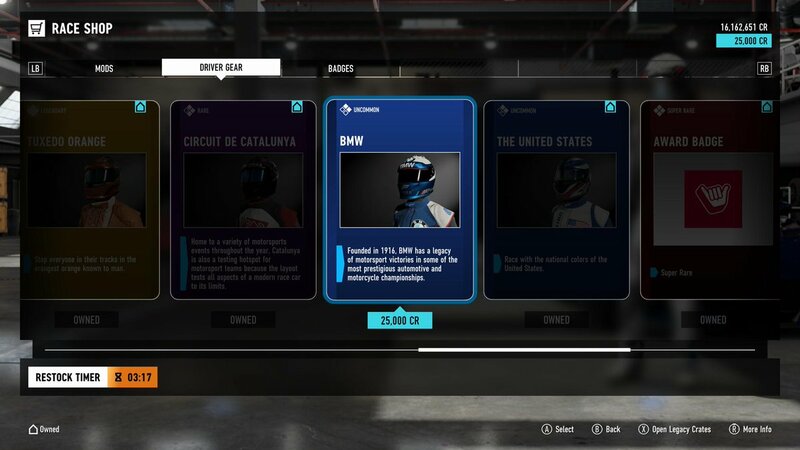 re: m.rossi driver suit, i found a reply here (https://www.reddit.com/r/forza/comments/ac86fc/any_one_have_the_m_rossi_driver_gear_yet/) that the M.Rossi driver suit was a reward for owning the physical FM7 disc on launch, and that it "may" be able to get the driver gear by obtaining a disc and booting the game from that. I've had the physical disc since early release, no m. Rossi. almost certain I saw m.rossi when the race shop first launched but couldn't afford it. Not seen it since. A nice suprise getting the GoW JD suit I thought I'd never get. Waiting on the same 4 as everyone else it seems. Next weeks Forzathon gives you the rare Jack Rabbit driver gear. The only customisation i want is to remove him off my menu screens...soooo annoying! I agree, just playing the game we've got.